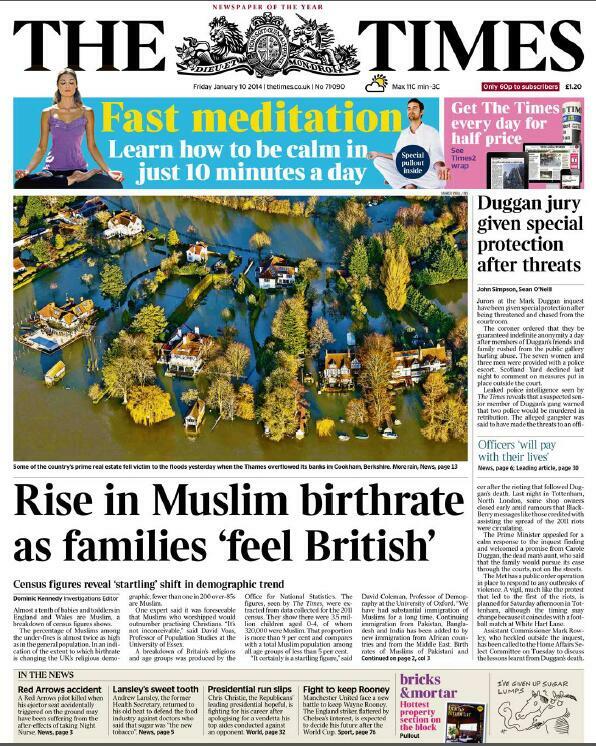 Today The Times has a report by its investigations editor Dominic Kennedy titled “Rise in Muslim birthrate as families ‘feel British’”. The article has been copied and pasted by the Telegraph (“Almost a tenth of babies and toddlers in England and Wales are Muslim, census figures show”) and by the Mail (“One in ten babies in England is a Muslim: Those practising the religion ‘could soon outnumber actively worshipping Christians'”). Based on an analysis of the 2011 census figures, the report reveals that over 9% of children aged 0-4 are Muslim, whereas Muslims of all ages make up less than 5% of the population. Yes, it’s yet another of those Islamification of Britain articles. One of the experts whose response to this news Kennedy quotes is David Coleman. He describes the figures as “startling”, although it is difficult to believe that a man who holds the position of Professor of Demography at the University of Oxford was genuinely surprised by the statistics. Kennedy doesn’t bother to tell his readers that Coleman is also co-founder of the right-wing campaign group Migration Watch and has a record of feeding the anti-immigrant hysteria of the right-wing press. Even Coleman, however, is unable to deny the fact that birthrate among the UK’s Muslim community is falling – the precise opposite of the false claim made in the headline to Kennedy’s report. It is a well-established demographic principle that the fertility rates of communities of recent migrant origin, particularly from developing countries, may be initially higher than those of longer-established communities but decline over time. A 2011 study by the Pew Research Center found that Muslims in the UK had on average 3 children in 2005-10, and predicted that by 2025-30 the figure would be down to 2.5. David Voas, Professor of Population Studies at the University of Essex, is also quoted by Kennedy as stating that it is “not inconceivable” that Muslims who practise their faith could outnumber churchgoing Christians – although Voas presumably based this argument more on the decline of religious belief and observance among the majority Christian population than on an increase in the number of Muslims. Kennedy doesn’t see fit to point that out. To back up this picture of cultural Islamification, Kennedy turned to Danny Lockwood, whom he cites as the source for his claim that “the fast-growing young Muslim population in Kirklees borough had led to old pubs, hospitals, houses and public buildings being turned into Muslim private schools, madrassas, mosques and a Sharia court”. Lockwood is introduced as publisher of the Yorkshire newspaper The Press. No mention is made of Lockwood’s far-right links or of the fact that he is author of a vanity-publishing exercise in anti-Muslim scaremongering entitled The Islamic Republic of Dewsbury. The only Muslim to feature in Kennedy’s report, Ibrahim Mogra of the Muslim Council of Britain, is reported as saying: “I just wouldn’t want our fellow citizens to be alarmed by an increase in number. This generation is very much British. They feel very much this is their home.” Philip Lewis, author of Young, British and Muslim, is similarly quoted as warning that the statistics could “generate alarmism”. This is evidently intended to convey the impression of balance. Of course, in reality, the purpose of Kennedy’s article is precisely to alarm those among the non-Muslim majority population who fear that Islam represents some sort of threat to them and their way of life. Here, for example, is how supporters of the English Defence League have responded to the Times report. Update 2: It’s only fair to add that Danny Lockwood strenuously denies having any “far-right links”. See the exchange of correspondence here. Almost a tenth of babies and toddlers in England and Wales are Muslim, a breakdown of census figures shows. The percentage of Muslims among the under-fives is almost twice as high as in the general population. In an indication of the extent to which birthrate is changing the UK’s religious demographic, fewer than one in 200 people over 85 is Muslim. One expert said it was foreseeable that Muslims who worshipped would outnumber practising Christians. “It’s not inconceivable,” said David Voas, Professor of Population Studies at the University of Essex. A breakdown of Britain’s religions and age groups was produced by the Office for National Statistics. The figures, seen by The Times, were extracted from data collected for the 2011 census. They show there were 3.5 million children aged 0-4, of whom 320,000 were Muslim. That proportion is more than 9 per cent and compares with a total Muslim population among all age groups of less than 5 per cent. Christians remain the largest religious group among those aged 0-4, at 1.5 million, 43 per cent. Professor Voas said he saw no prospect of Muslims becoming a majority in Britain. Rapidly growing Muslim families are making their mark on society, however. The Department for Education lists 136 Muslim schools, 125 of them in the private sector. Britain’s first halal food festival, intended for the British Muslim middle classes, attracted 15,000 visitors to the London ExCel in September. There are already 1,600 mosques. Ibrahim Mogra, assistant secretary-general of the Muslim Council of Britain, said that the large number of young Muslim children reflected the confidence that Muslims had in the country, encouraging them to bring up families here. Danny Lockwood, publisher of The Press in Batley, West Yorkshire, said that the fast-growing young Muslim population in Kirklees borough had led to old pubs, hospitals, houses and public buildings being turned into Muslim private schools, madrassas, mosques and a Sharia court to satisfy rising demand from families. “When the families manage to keep their young people close to them, there is a great work ethic and their children are incredibly high achievers,” he said. The rise in the number of young Muslims is reflected in the diversity of immigrant children in schools. A recent report from Birmingham City Council said that pupils in the city spoke 108 languages. Thousands had Urdu, Punjabi, Bengali and Somali as their mother tongue. Philip Lewis, a scholar of Islam and author of Young, British and Muslim, warned that the one-in-ten birthrate statistic could “generate alarmism”. He emphasised the variety of the Muslim population across the country, which in London included an affluent Arab elite and Europeanised Turkish Cypriots. In parts of the urban North, though, there was a “bicultural reality” of indigenous and Kashmiri working classes. “We don’t have genuine diversity in many of these northern mill towns or great swaths of Bradford,” he said. This entry was posted in Analysis & comment, English Defence League, Far right racists, Featured archives, Right wing, UK by Bob Pitt. Bookmark the permalink.